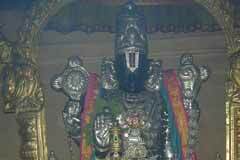 Saint TirumangaiAzhwar had sung the glory of Lord in his Mangalasasanam hymn. 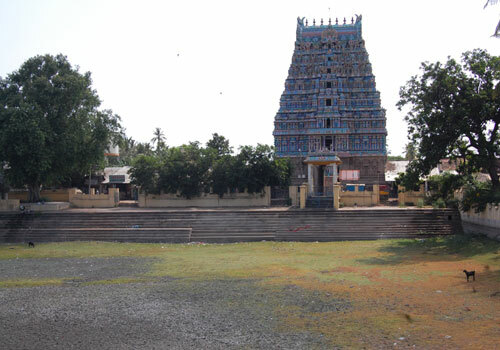 Sri Saranatha Perumal Temple, Tirucherai, Thanjavur district. Devotees pray for relief from the consequences of sins committed. 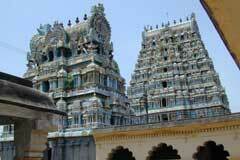 It is believed that worshipping Saranatha Perumal brings benefit of 100 baths in Cauvery. Mother Bhoodevi’s father was Sage Markandeya. He has his place in the sanctum right of Lord. He attained salvation in this place. 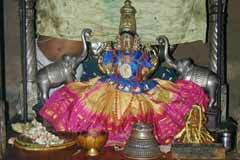 When the sage came to know that Lord Perumal loved his daughter, he told the Lord that she was a little girl and did not know even how much salt to be added to food. Perumal said that she can cook without salt at all and that He would accept it and married Mother Bhoodevi. 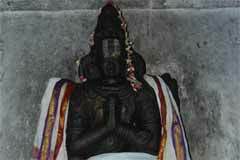 Thus Perumal came to be known as Uppiliappan-Lord accepting food without salt. 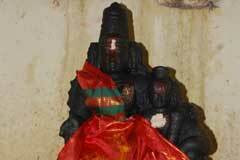 King Azhagia Manavala Naicken was sending stones for the renovation of Mannargudi Sri Rajagopalaswami temple. The carts carrying the stones were routed through this place as per instructions of the king. Other Perumal devotee Narasabhupalan took one stone from each cart for the renovation of this temple. When the king came to know of this, he came here for enquiry. 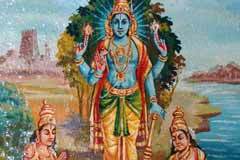 When the devotee prayed to Perumal, He granted darshan to the king as Lord Rajagopalaswami. Excited king executed renovations for this temple too. According to scriptures, during the Pralaya the devasting floods, Lord Brahmma took the soil of this place, made a pot and placed the Vedas in for safety. Mother Cauvery begged Perumal that she too may granted the status of Holy Ganga considered superior in washing off the sins of those bathing in the river. She performed penance for the boon under the Bodhi tree on the western bank of Sara Pushkarini. Pleased with her penance, Perumal crawled on the lap of Cauvery as a little child. Cauvery said that she was not for that boon alone. Perumal appeared before her with His five consorts. Cauvery begged Perumal that He should stay in the place in the same form. Obliging Cauvery, Perumal also granted a space to her in the Sanctum Sanctorum to His left, which devotees can see even now. 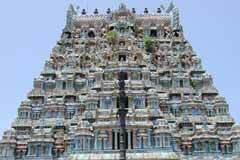 Miracle Based: The temple is one among the 108 Divyadesas of Lord Perumal and this is the only temple where He grants darshan to devotees with five consorts, Sridevi, Bhoodevi, Mahalakshmi, Saranayaki and Neeladevi. 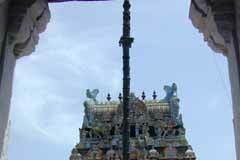 As the soil is very fertile (Saram), Lord is known as Saranatha Perumal and the place Tirucharam which later changed as Tirucherai.